As Ed and I live in a flat we are always guests at other people’s BBQs, so we need a contribution that is easily transported or can be assembled on site. If it can be prepared ahead so much the better. My go to pudding to take to parties is usually a pavlova, along with a coolbag containing tubs of whipped cream and berries; 60 seconds of assembly and you have a pudding to wow! 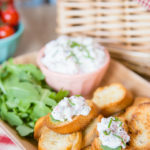 I predict that my hit for this summer will be this luxurious but very simple lobster dip, which is perfect to serve as canapés piled up on a home made crostini – ideal grazing fodder whilst you are waiting for the BBQ to get going, or as an indulgent filling for a baguette. The star ingredient here are frozen lobster tails – simply defrost and simmer, bake or fry for a delicious, indulgent ingredient with the wow factor. Frozen coriander adds freshness to the dip, and once baked par baked baguettes can be turned into crostini, or used as they are. To make the crunchy crostini simply bake the baguettes as per the packet instructions, allow to cool, slice as thinly as you can, brush both sides with olive oil, sprinkle with pepper and salt, pop onto a baking sheet and return to the oven for 10 minutes until crunchy. Allow to cool and pop into a tin where they will keep for a couple of days. If you are planing on taking lobster baguettes on your picnic, cook the bread that day, allow to cool before slicing, buttering and filling with salad. 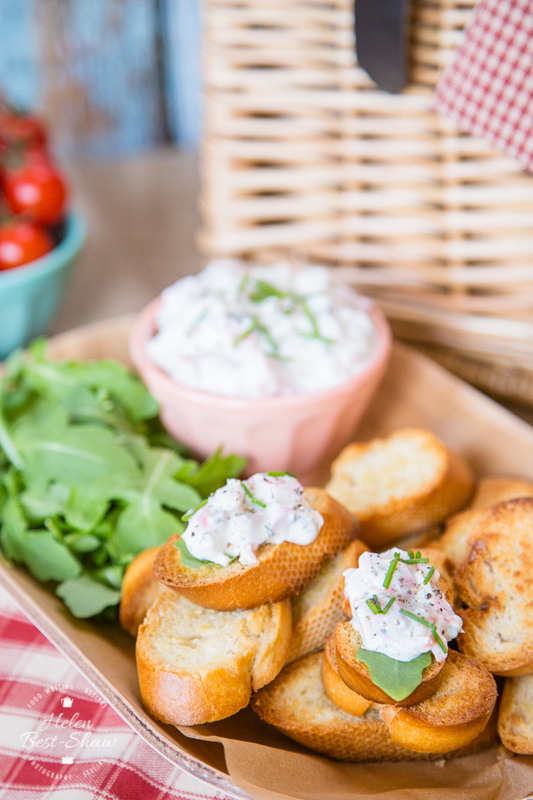 Add the lobster dip just before you serve to avoid soggy bread and a potential mess in the picnic basket. Transporting the lobster dip in a pot or tub makes it easier to keep it safely chilled too. 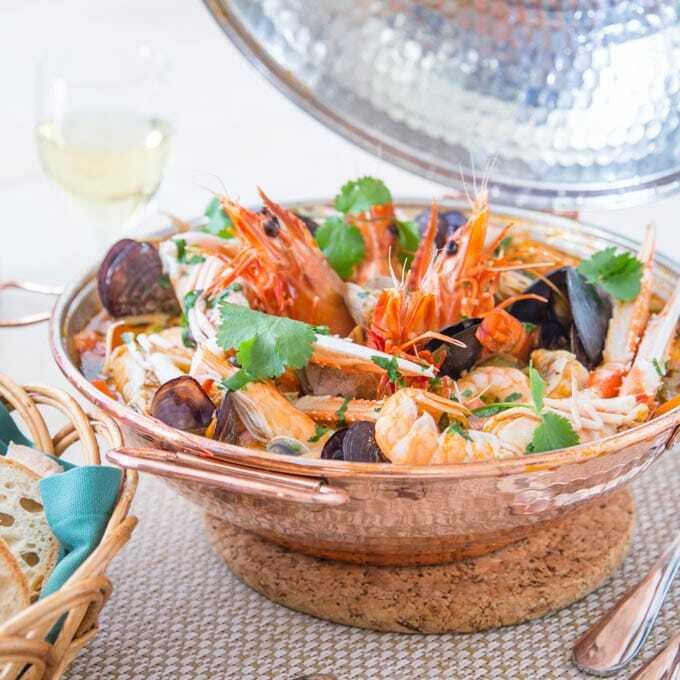 For another idea for using lobster tails try my traditional Portuguese seafood cataplana. If you try this Luxurious & Simple Lobster Dip Two Ways please tag #FussFreeFlavours on Instagram or Twitter. It is amazing for me when for me when you make one of my recipes and I really do love to see them. You can also share it on my Facebook page. Please pin this recipe to Pinterest too! Thanks for reading Fuss Free Flavours! Place all the ingredients into bowl and mix well. Serve with home made crostini, or as an indulgent sandwich filling. Freeze the lobster shells for stock at a later date, or heat with some oil to to make a richly coloured and flavoured lobster oil.